We arrive at Mission Beach and immediately dig into the earth. Some of us further than others. 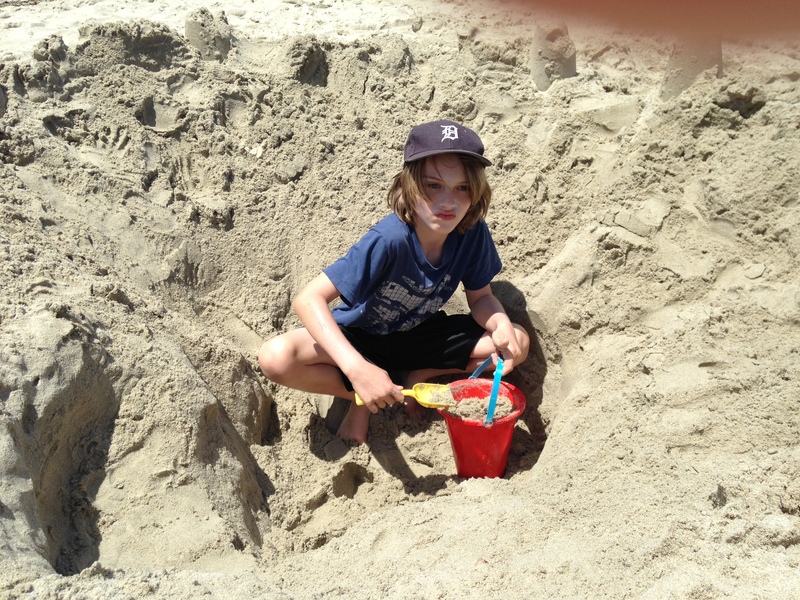 Clad in a Detroit Tiger’s cap and determination, Demian takes over a hole dug by other beach-workers and continues the business of excavating. Eventually he sheds cap and shirt and runs into the Pacific where he jumps waves, stands against white-caps, and finally charges the raging blue along with Jordi, seeking secrets of the sea. Sky is bright, but along with a burning sun there’s always a cool breeze sweeping the coast. People everywhere absorb light, play in waves, shape sandcastles, walk the boardwalk, ride bikes, laugh at being alive. I walk the beach with Demian kicking up kelp, lie next to Gabriela and sun-bathe, then finally after a couple of hours we pack up the gang and set off back home. Of course, I’ve been thinking about the feijoada and have decided the best course of action remains to shift the beans and meat from the questionable pot (Helena blamed the “possible” burning on the pot) into a safer vessel and tend it with constant stirring. We still need to buy more kale, oranges and I have plan to pick up an appropriate beer. Jordi has a malbec waiting, but my idea of eating feijoada includes quaffing malt. 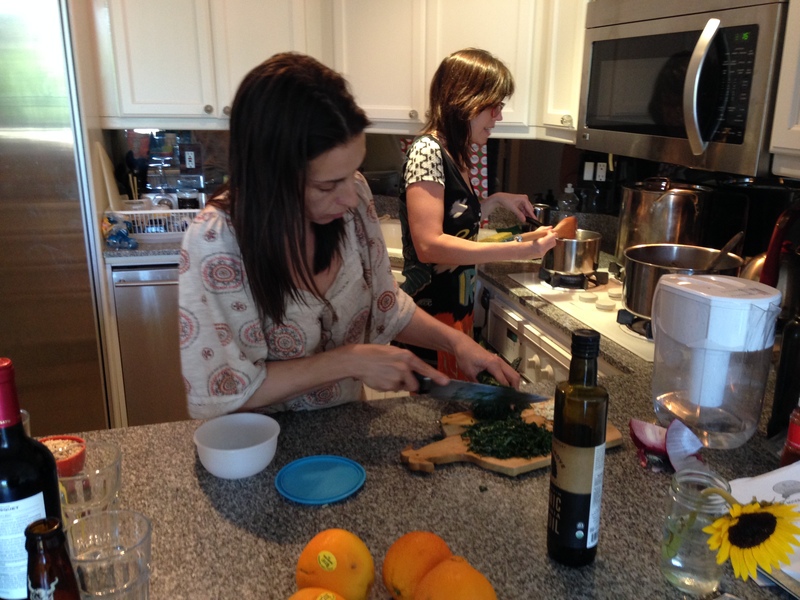 We drive back into downtown, park the cars, Gabriela and Helena begin to tend to kale and rice and I walk off to Jimbo’s and find the remaining ingredients plus Stone Saison, recently released. Back at the apartment, last minute preparations heat up. 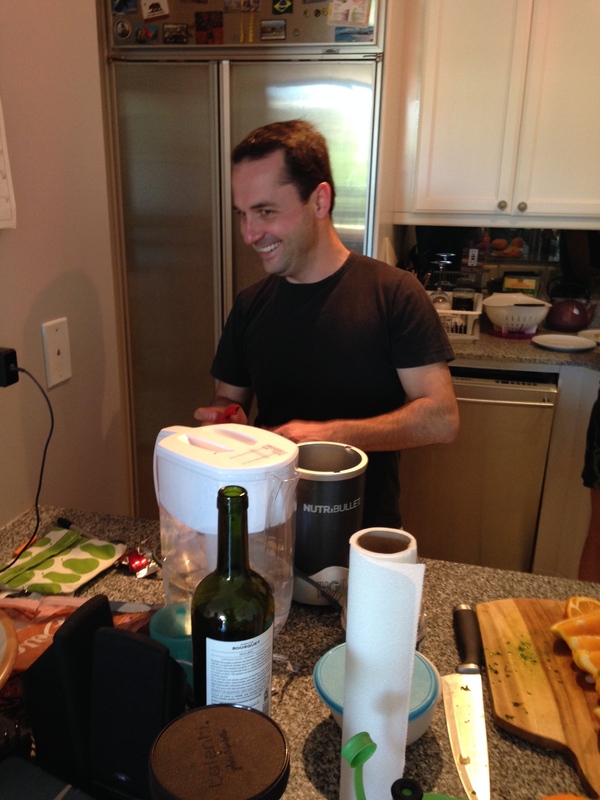 Jordi receives instructions to make gin and tonics. We move into the homestretch as the feijoada is plated, table set, glasses filled, and finally we eat. All in all, I’m pleased, as is everyone else. 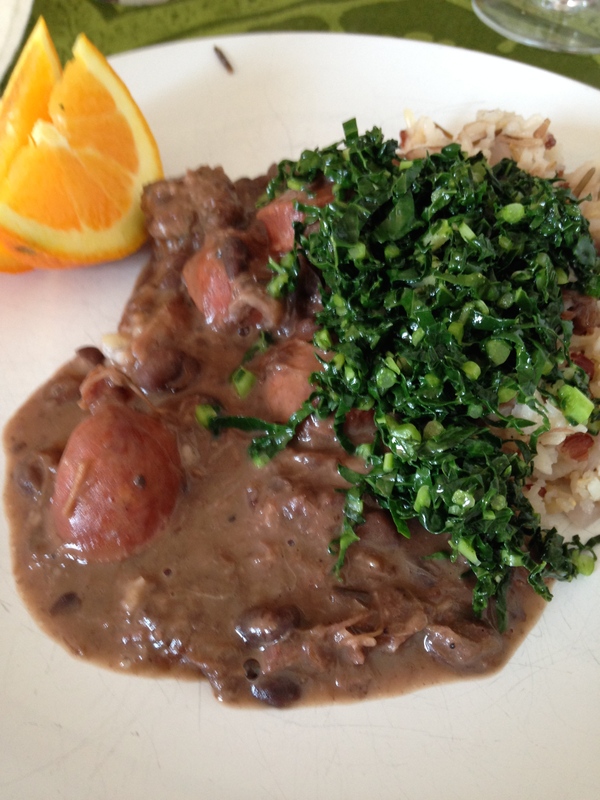 A slight “toasty” taste remains but this feijoada has the appropriate look, consistency and taste, especially when you add thinly-sliced kale sautéed with olive oil and garlic, and freshly-squeezed oranges. Everyone has a few helpings and then it’s off to a siesta. I’ve been thinking about Wendell Berry’s first chapter where he quotes a poem In Time of ‘The Breaking of Nations’ by Thomas Hardy. Hardy’s poem looks into the abyss of World War I and finds affirmation in the lives of those who work the land, “War’s annals will cloud into night / Ere their story die” Hardy concludes. “Their story” is a lasting human drama as Hardy sees it, as “great” events demanding headline space disappear into irrelevance. 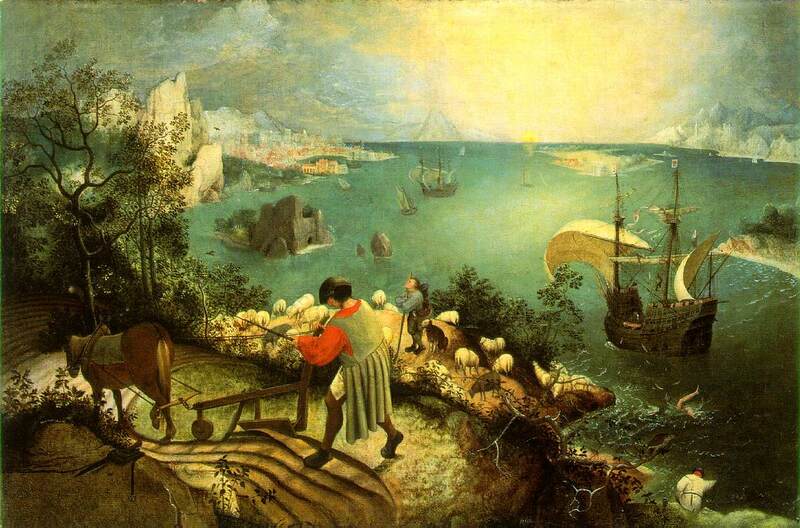 Reading this poem I think of Pieter Bruegel the Elder’s painting Landscape with the Fall of Icarus. Berry and Hardy celebrate a head bowed to the earth, working the soil with age-old tools, and I as well can see the wisdom of acknowledged human limitations, of a deep sense of connection to the earth and its seasonal rituals. Bruegel’s painting encourages us to read an allegory where the mythic failure of Icarus, his fall as punishment because he did not listen to his father’s advice, passes unnoticed as a ship sails and the world continues. But an allegory leading where? I understand Berry’s warning that it’s better to “harrow clods” then exhaust the soil as machines harvest row after row of monoculture farms and those of us who may have never dug our hands into dirt drift further away from a necessary connection to the land; and yet, I am one of those who also seek a way past time-worn rituals, who understands why Icarus does not listen to his father, aims for the sun, and falls to his death. 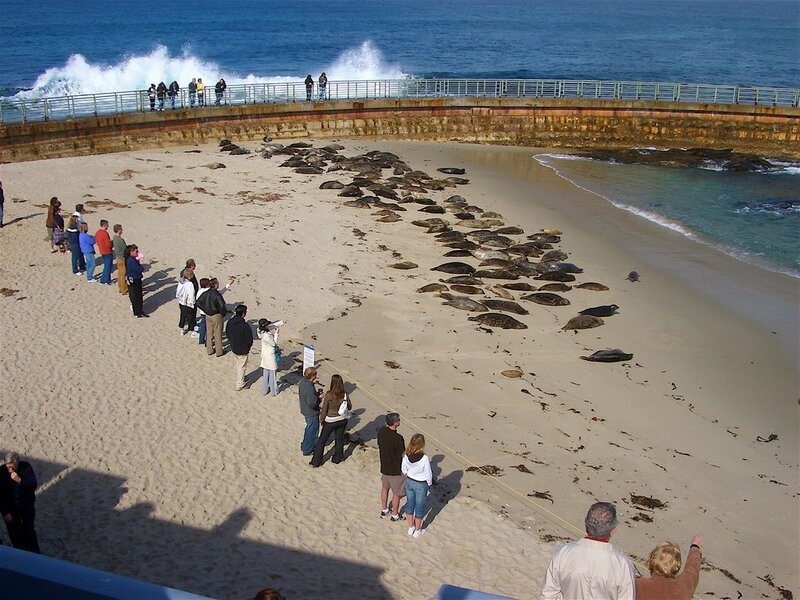 We have our siesta, drive to La Jolla, and watch the seals ignore us.